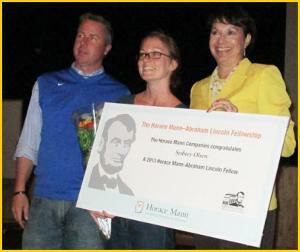 Sydney Olson, a teacher at West Orange High School, will take part in the Horace Mann - Abraham Lincoln Fellowship Program in Mr. Lincoln's hometown of Springfield, Illinois, this summer. Only fifty teachers and/or school administrators have been chosen, during a nationwide search, to take part in the 2013 Fellowship Program. While in Springfield in June or July, Miss Olson will get a behind-the-scenes look at the Abraham Lincoln Presidential Library & Museum. The Fellowship Program includes lectures by library staff and Lincoln experts who provide great insight on Lincoln & the Civil War. The five-day event includes special guided tours at Lincoln's Tomb, Lincoln's Home & the Village of New Salem where Lincoln lived as a young man. Horace Mann agent, Simone Baldwin says, "Miss Olson is in for an experience she'll remember for a lifetime." The Fellowship features two five-day Programs, one in June & one in July, and includes round-trip transportation, lodging and most meals, all provided by the Horace Mann Insurance Company. About Horace Mann Insurance Company: Horace Mann is the largest national multiline insurance company focused on educators. Founded by Educators for Educators in 1945, the company is headquartered in Springfield, Illinois. Horace Mann is also a District wide Partner-In-Education with Orange County Public Schools and is noted for their annual sponsorship of the Five-Star Awards Banquet.